Here are some more projects from my Away with the Fairies weekend which seems ages ago now. These were done in a session with Michele Charles. The photo at the top is an ATC folder which started life as plain white and was transformed into this with stazon inks, stamps and a stencil. 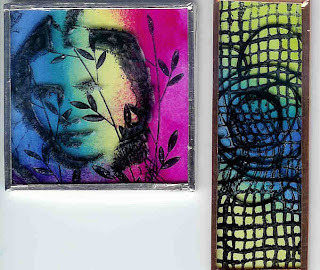 The other two pieces are glass slides which were again coloured with stazon and then stamped. The one on the right wasn't too successful as the background scrim image is too heavy to allow the flower to show properly. Ah well, I'll know for next time and I loved the technique. Previously I had only used stazon ink to stamp focal images and hadn't tried it to colour backgrounds - so now I need to buy some more colours! 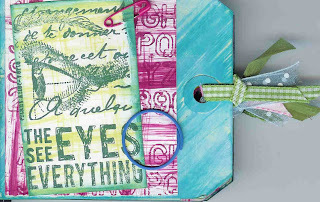 The top image here is a little tag book we made with Leandra Franich using PaperArtsy stamps (which I love) and the new Ranger paint daubers. Every page uses red, blue and green and it's got a lovely bright, fresh look. 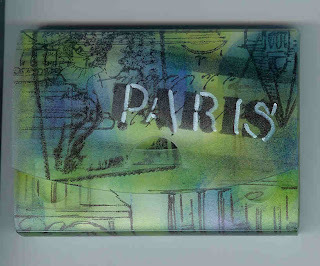 The other is an ATC holder with an ATC slotted in and this was another project done with Claire Hampton. 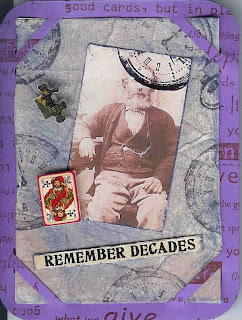 Particularly interesting on this ATC is the background which was made by sticking bits of masking tape on and rubbing inks in and the look and feel is similar to an old leather bound book. So that's most of what I made on my weekend - the other bits and pieces aren't quite completed yet! One day when I finally finish my sketchbook for my course. I just "came by" to see your stitches, and I discover you also like to work with paper, I love your tags! Like Corina I just dropped by to see your stitches and happened to notice the paper work also. I also dabble with paper things as well.